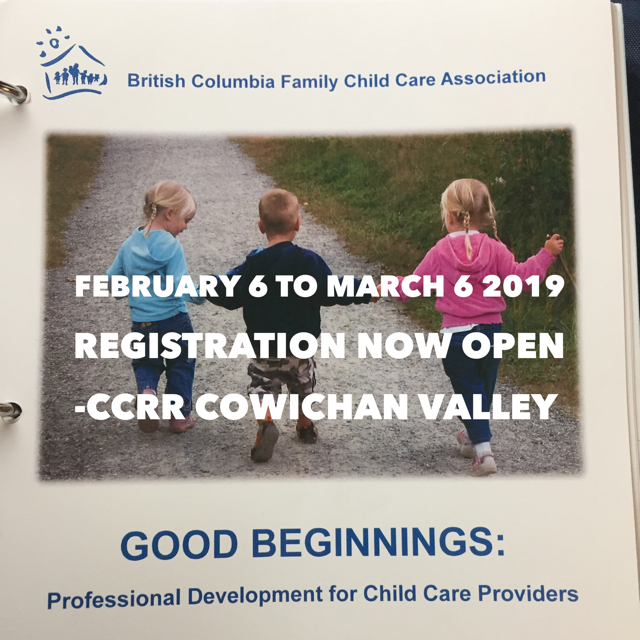 Cowichan Valley CCRR is accepting names of people interested in working in child care and require their 20 hours of child care related training. Below is a brief outline of the Responsible Adult and Family Child Care training programs. If you are interested in taking this training in February and March 2019 please phone 250-746-4135 Ext. 231 or email cbarclay@clementscentre.org. This innovative training encompasses two levels of child care training, the Responsible Adult and the Business of Child Care. The sessions will be run concurrently. The GOOD BEGINNINGS courses will help students to explore the above mentioned areas of Child Care, as well as guide them to create specific policies and procedures necessary to develop a quality child care business. In addition students will be introduced to a network of Family Child Care Providers, and receive resources and contacts to support their child care journey. Carmen is a life-long learner and has four adult children and four grandchildren. Her passion for quality child care is a pillar of the work she does. Carmen started as a License Not Required child care provider, and moved into Licensed Family Child Care. Her roles evolved into, Facilitator, Early Years Coordinator, CCRR Program Coordinator, self-employed Child Access Supervisor, and Holistic Health & Lifestyle Coach. Carmen has many years’ experience teaching the GOOD BEGINNINGS: Professional Development for Child Care Providers and was an active member of the Professional Development team that revised the training in 2017.